Gallia Survivor Services Advanced Trauma Practitioner Amy Sisson discusses the differences between trauma and resiliency. 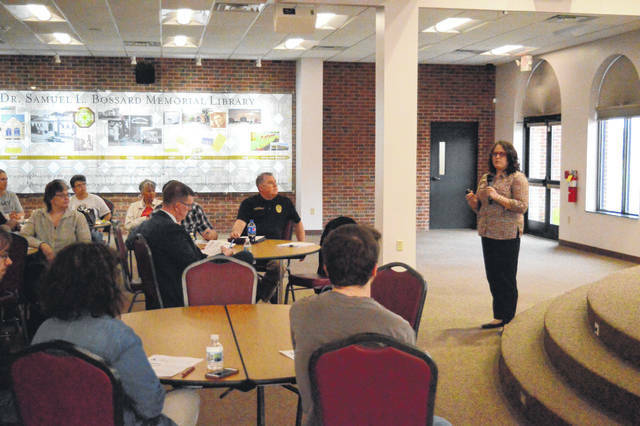 GALLIPOLIS — The Gallia Prosecutor’s Office in partnership with Bossard Memorial Library held an informational presentation about the importance of understanding trauma in people undergoing challenges and how local faith-based organizations can help them. Gallia Prosecutor Jason Holdren welcomed several area churches to the presentation and introduced Gallia Survivor Services Trauma Practitioner Amy Sisson along with Gallia Victim Advocates Regina Brown and Cindy Perkins. Gallia Juvenile Court Chief Probation Officer would also share personal experiences dealing with traumatized youth while serving the county. Sisson and Plantz discussed the differences of the left and right human brain. Left-brained individuals tended to be more focused in logic and analytics where those who were right-brained tended to be more creative. Some share qualities or may not be dominant in one side or another. However, trauma is focused in the right side of the brain, the pair said, as it is a center of emotion. Trauma examples cited included sexual assault, physical assault, harassment, living through a nasty divorce, caring for loved ones through a violent illness and more. Sisson said that triggers were a real thing to be considered for those who had suffered trauma, despite them often being mischaracterized in society or utilized in discussion incorrectly. The smell of a freshly cut lawn triggered a woman Sisson spoke of as an example because that woman was raped on a lawn. Veterans who heard a loud and sudden sound might duck and cover even though they weren’t in any danger at the time but were reliving a memory from time spent overseas. Sensory input was connected with the right side of the brain, said Sisson, therefore certain smells or sounds could trigger someone to return to a traumatic memory. Plantz, having spent several years as a youth pastor and educator, said that one never knew what another might have experienced in life. He said he had witnessed a child cower in fear when being yelled at in a class for reportedly acting out and was later discovered to experience abuse and beatings at home. Plantz said he spoke with an older man he respected, who he knew had endured challenges throughout his life, and asked him what he thought about surveys referencing potential trauma. The man replied that he had gotten over it and others should “pull themselves up by their bootstraps.” The idea of overcoming one’s challenges is important, said Plants, and he began to discuss the idea of resiliency. Some are more resilient to challenges than others. Some may have endured more trauma than others, both he and Sisson said, but those who had loving and stable adult figures or friends in their lives were better able to overcome those challenges, even if those challenges might be more numerous than another person’s struggles. Sisson encouraged others to be curious why a child was misbehaving and if there were deeper issues at hand. She said she felt that the more science revealed that the answer to healing trauma was developing caring and strong relationships, the more she felt the teachings of Jesus Christ were proven to be true and that it was something believers already knew.